Samsung is launching a new e-reader called the S60 in the UK on August 26. The company will partner with WHSmith, a book, music and electronics retailer similar to Amazon (NASDAQ: AMZN). The S60 has a 6 inch screen and 2 GB of memory. There is an option of adding memory with an SD memory card. 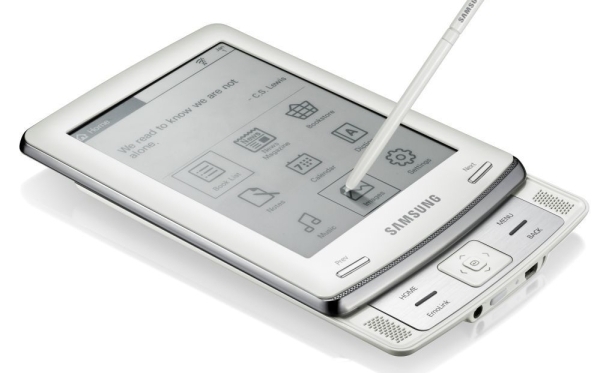 The S60 includes a stylus that allows the reader to make notes and annotations. I really like the idea of using a stylus over using the the keyboard on the Kindle and Kindle DX. The Kindle’s keyboard is tiny and adds unnecessary space. The drawback would be having to keep up with the stylus. If the S60 is anything like the Nintendo DS, Nintendo’s handheld gaming device, it should include a slot for the stylus when it isn’t being used. The S60 is Wi-Fi only so you would have to download books from home or a Wi-Fi hot spot. Amazon offers a choice of Wi-Fi or 3G versions of the Kindle. As for book formats, the device includes ePub, PDF and TXT files, as well as MP3 and text to speech options. Samsung is a great company known for its well designed electronics. The sleek design of the S60 holds great promise and possible competition for the Kindle, however, it is still a bit pricey and is currently targeting the UK market. This entry was posted in E-Book Readers, Kindle Competition and tagged electronics, keyboard, S60, Samsung, stylus, wi-fi by holly. Bookmark the permalink. 1. Could you comment the ONYX BOOX 60 EBOOK READER. 2. I just bought a Kindle DX Graphite, I’d like to use it to browse websites in Chinese. Can your “Unicode Fonts Hack for Kindle DX” apply to the Kindle DX Graphite ?